This morning on the drive home from tennis camp (round #2), a trip to TarJay for cleaning staples, Office Depot and a Hail Mary trip to WallyMart for the cute index cards (for once, WallyMart actually came through) for my homekeeping project, I heard several clicks followed by an excited, "Mama LOOK!!". I glanced in the rearview mirror and then had to pull over so I could snap a picture. Have I mentioned how much this girl cracks me up? I hope I'm never rushing around too much or too distracted by other things to miss out on her little quirks and funny sayings. I don't want to forget how she calls exclamation marks exciting marks or how she informed me her underpits stank after tennis camp (we squeezed in a bath before her dentist appointment). Because it's the little things like these that make life much more interesting. Now that is some car seat safety! I love this age and all the hilarious quirks and funny sayings. AMEN to not wanting to forget their adorable sayings. And I've driven plenty with you...it is NOT your driving! That girl cracks me up and I love her to pieces! How funny! 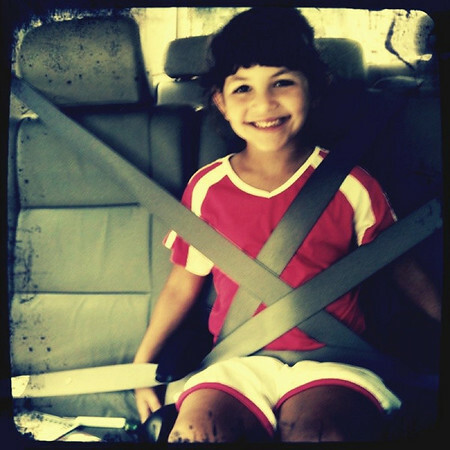 That's how I'd like to buckle up when driving with my mom, she's crazy. I love the hilarious things kids say. I may have to start calling them exciting marks too. keep documenting…they are all grown up before you know it! and then you aren't so keen on documenting their expressions and sayings. although….I wonder if it would help if we did document those teen expressions!